When assessing the agreement between two methods, it is useful to the plot the difference between methods against the mean of the methods (a difference plot). A difference plot is, effectively, a scatter plot rotated 45 degrees clockwise. However, a difference plot is more informative than a scatter plot since the data points are not tightly clustered around the diagonal. A difference plot also clearly shows any relationship between the differences and the magnitude of measurement. To illustrate this concept, we will use an example from Bland & Altman’s 1986 paper. 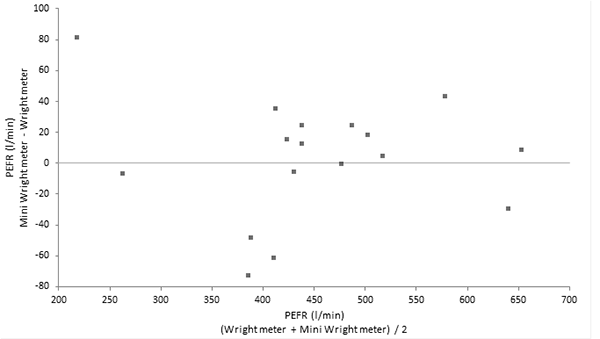 This example compares two methods of measuring peak expiratory flow rate (PEFR). On each of 17 subjects, two measurements were taken with a Wright meter, and two with a mini Wright meter. On the Analyse-it ribbon tab, in the Statistical Analyses group, click Method Comparison, and then click Difference plot. In the X variable drop-down list, select Wright meter. In the Y variable drop-down list, select Mini Wright meter. Select the 1st replicate option. Per Bland & Altman‘s paper, only the first measurement (replicate) by each method is used to illustrate the difference plot and limits of agreement. Both measurements (replicates) are used in the study of repeatability. The points on the difference plot roughly form a constant width horizontal band across the measuring interval, and there is no obvious relationship between the difference and the mean or the variability of the measurements and the mean.